The ROTM module is available as part of the DAPtools Standard software package. All xDAP systems can use the ROTM module. The Rotating Machinery Analysis Module (ROTM) provides processing extensions that enable significant capabilities beyond what you can get by sampling on a "fixed-rate sample clock" or by direct "encoder clocking" alone. Most measurements of rotating machines are done using a "shaft encoder" that generates digital logic pulses as the main shaft moves through equal angles of rotation. This serves many applications well, and, of course, this requires no special processing module. However, it does require some careful routing of sensitive hardware control signals, and it is subject to some awkward constraints. When these encoder signals are used to slave the data sampling to hardware clock signals, you lose all information about speed or elapsed time. You can't tell how fast or slow the rotations are, because the number of measurements per rotation is always the same. At low speeds, when encoders advance slowly, frequency resolution is lost, and the elapsed time between pulses can grow to the point that significant effects are missed. At high speeds, when encoders spin really fast, the number of samples increases in proportion, and this can results in hugely redundant data sets and, in some cases, capacity problems. The ROTM module avoids these problems by always sampling at a high steady rate, so that the data streams are fully accessible regardless of rotation. 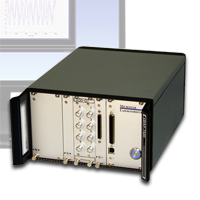 Instead of locking signal capture to encoder pulses, the analysis watches for them. The pulses are readily detectable, and it is clear where these pulses occur with relation to other measurements captured on the internal sampling clock. So the values of the signal can be extracted from the high-resolution streams either at equal time intervals, or at time intervals determined by the encoder pulses. The speed can be continuously varying – and regardless of where the encoder pulses occur, the steady-rate sample stream knows the corresponding signal values there with high resolution. Since the encoder-based version of the signal is essentially software driven, this software is not constrained to evaluate solely at positions dictated by each and every encoder pulse. Knowing the rate at which pulses are arriving, this processing can build the data stream using more data, or less data, at higher or lower resolution than hardware signals directly support. It's all adjustable in the configuration script. Nothing locks the high-rate sampling clock and the rotation-locked encoder pulses into any kind of explicit relationship, since rotation speed can change continuously. This hints of a possible complication. What happens if the clock pulses and the encoder pulses don't exactly align? (In fact, perfect alignment is rare.) That misalignment would induce what looks like some kind of timing jitter – it would if these effects were not accounted for. In fact, the ROTM module continuously takes fractional sample positions into account, applying classical DSP techniques to calculate between-sample signal values accurately. How accurately? Well, nothing is perfect, but when the errors are smaller than the rounding errors caused by the last bit of your sampling hardware, you would never know. Total harmonic distortion? Less than 1 bit for signals of absolute maximum magnitude. Approximation noise? Less than 1 bit for signals of absolute maximum magnitude. Use simpler hardware connections to get the same datasets. Sample at higher angular resolution than provided by the hardware encoder. Sample at lower angular resolution than provided by the hardware encoder. Retain both time-based and encoder-based data blocks from an experiment. Locate encoder-based data sets from events detected in time-based samples. Locate time-based data from events detected in encoder-aligned samples. Extract profiles of instantaneous rotation speed and acceleration. For more detailed technical discussions and application information, see the User's Manual for the ROTM module.